Visit the stunning minimalist home of Bec Dowie, located in the New Zealand countryside. Love this one. Bittersweet news from Covet Garden this week — the new issue is out, but sadly it's the last one. Follow the link to read — and revisit the back issues, too. Will really miss this one. Take a tour of artist Elizabeth Colombo's light-filled West Harlem apartment studio. Wish there were more photos, but her work is beautiful — and her space has some really inspired ideas, such as the interior windows and the one shelf running around the top of the studio walls. Twice a year, the new designers at fabled Paris fashion house Courrèges visit the brand's workshop in Pau, France, to reconnect with the company's origins — see the slideshow for more. Fantastic building, designed by Andre Courrèges to look like "an upside down bridge". Corinne Bailey Rae has put together an interesting playlist of songs for Mother's Day (including one of her own) — have a listen. 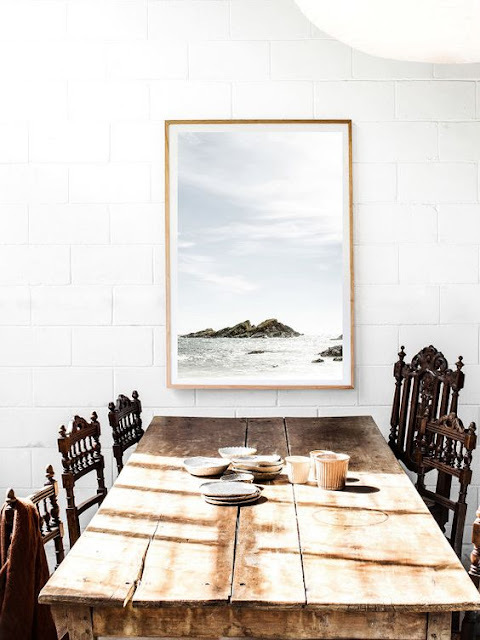 Stylists share 12 ways for displaying art without putting nails in the walls — perfect for anyone who's faced with concrete or crumbly plaster walls (or just likes to change things up a lot). Learn Julia Child's foolproof technique for getting perfect poached eggs — no vinegar or straining needed. Haven't tried this yet myself, but definitely intrigued to see if it really works. Kate Young continues her fascinating series of recreating food from books with this dish from Virginia Woolf's novel A Room of One's Own. Makes you both want to read and eat (possibly at the same time).